Denise Croker is a University of Limerick industrial chemist graduate, and completed an industrial PhD in process engineering with Aughinish Alumina Ltd under the supervision of Prof Kieran Hodnett. After a period working with Aughinish as a process engineer, Denise returned to the first iteration of the SSPC in 2008, then the Solid State Pharmaceutical Cluster, as a postdoctoral researcher. The first PDRA in the Centre, Denise took responsibility for the PDRA working group, targeted industrial projects and co-supervised 2 PhD students, ultimately generating 22 published articles. In 2011, Denise joined MSD Ballydine as a project engineer working in technology transfer and commercialization, and completed a technical rotation to the parent Merck process development centre in the US. 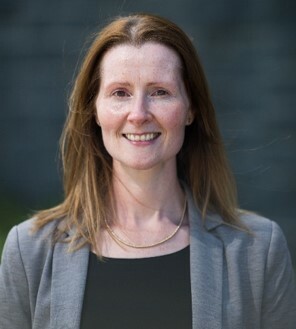 In 2014, she returned to UL to take an academic position and active research role in the group of Prof Gavin Walker and with the expanded Synthesis and Solid State Pharmaceutical Centre (SSPC). In her time to-date in this role, Denise initiated and managed a €500,000 EI innovation Partnership Project with Pfizer and Eli Lilly, and led a €4million SFI infrastructure investment in a Crystallization, Isolation and Drying Technology Test-bed. In 2018, Denise assumed a new role as General Manager of the SSPC taking overall responsibility for operation and progression of the Centre.